Giedo van der Garde made his F1 debut with the Caterham team in 2013, but after one season with the squad, he was dropped. Instead, he joined Sauber as a reserve driver, signing up with the Swiss team for the 2014 season. The Dutch driver made his practice debut with Sauber during the Bahrain Grand Prix weekend but it did not lead to another race drive within Formula One. Van der Garde earned his stripes in karting, winning races and titles in the Netherlands. He moved up through the Formula Renault 2000 series, before joining Formula 3 in 2004. His work in the Formula Renault series had given him the opportunity to be part of the Renault development programme, but after a disappointing first season in Formula 3, he left the programme. After three seasons in Formula 3, Giedo had a solitary victory to his name and a handful of podium finishes. He joined Victory Engineering to drive in the Formula Renault 3.5 series, debuting in 2007. At the same time, the Dutch driver was already getting a taste of how complicated F1 could be. Ahead of the 2007 F1 season, Van der Garde was announced as a reserve driver for the Super Aguri team, but just a couple of months later, he was also confirmed at Spyker F1. 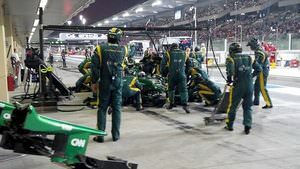 The two teams argued over the driver, with an eventual submission to the Contracts Recognition Board. Giedo remained with Spyker F1, but failed to turn the opportunity into a race seat. Instead, he concentrated on his other single seater responsibilities. After a Formula Renault 3.5 season racing with Victory Engineering, he moved on to P1 Motorsport and finally started to see some results, winning the first two races of the 2008 season and taking the title. GP2 teams were starting to take notice, and Van der Garde made the step up to participate in both the GP2 and GP2 Asia series. He won three races in his first year with iSport International, and won twice more with Caterham in his final GP2 season of 2012. The link with Caterham allowed him to make the step up to Formula One in 2013, joining the Caterham F1 squad for the full year. It wasn’t a particularly impressive year but not a disaster either. However, the team were looking for a driver with more funding behind him, and Van der Garde was squeezed out at the end of the season. He joined Sauber F1 for 2014 as one of their reserve drivers. In 2016, Van der Garde joined the World Endurance Championship, 24 Hours of Le Mans and he won the European Le Mans Series for G-Drive Racing. 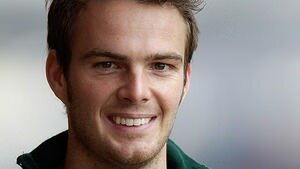 Learn more about Giedo van der Garde with the Pocket F1 Handbook. 29/07/2007 Episode 28 - 2008 already? Adrian Sutil runs wide at the bottom of the hill, getting a pretty big run up, albeit across the grass. Giedo van der Garde frowns watching on in the Sauber garage. Adrian Sutil has hit back at rumour mongers who suggesting Giedo van der Garde might be in line to replace the German before the end of the season. "I think for half of my career they have said 'Adrian is out' but I'm still here and at my 120th Grand Prix. I'll be here a lot longer. Sorry but you'll have to live with my face! "You can always ask me and I will give you the right answer. This comes from someone out there who is bored or whatever. I don't know their problems, but we are good as a team and trying to get out of this difficult situation." Giedo van der Garde and Felipe Nasr were the only reserve drivers to make an appearance during free practice. Alonso topped the times early in the day, while Lewis Hamilton finished top of the table on Friday afternoon. FP1 results and FP2 results cover the fastest times and total laps covered by all of the competitors today. There will also be two days of testing after the race has been completed, and we already know that Giedo van der Garde will get an opportunity to test, whilst Sauber will also give Sergey Sirotkin some seat time to allow him to secure a super licence. Giedo van der Garde previous stop, he's in 18th place, the best of the back markers at the moment. Picture via @MyCaterhamF1. Hülkenberg takes his drive through penalty. Giedo van der Garde also comes in for his stop, keeping ahead of his teammate. Lewis Hamilton pits, Daniel Ricciardo and Giedo van der Garde also follow in. More replays, it looks like Giedo van der Garde turned in on Kimi, who probably wasn't expecting the backmarkers to behave the way they do. Collision inevitable.